The Mulam ethnic minority has a population of 207,352, of which the majority live in <?xml:namespace prefix = st1 ns = "urn:schemas-microsoft-com:office:smarttags" />Luocheng County in the Guangxi Zhuang Autonomous Region. Others are scattered in neighboring counties. In the Qing Dynasty (1644-1911) the Mulam areas were divided into "Li," under which were "Dongs" – units of ten households. Even prior to 1949, the farming economy of the Mulams was comparatively advanced. Farming techniques, crop varieties and tools were basically the same as those of their Han and Zhuang neighbors. Oxen and water buffaloes were the main draught animals, although horses were sometimes used also. Some 60 percent of arable land was taken up by paddy fields, and the Mulams had long known the use of manure fertilizer. The Mulams' well-developed irrigation system, unfortunately, was under the control of the rich landlords, who channeled most of the water off for themselves. The encroachment of insects and wild animals was a serious problem for the Mulam farmers. Prior to the founding of the People’s Republic of China, land in the Mulam areas was heavily concentrated in the hands of the rich landlords, especially the most fertile parts. The landlords demanded that their tenants pay rent in kind and provide unpaid labor service. They also exploited the poorer peasants by means of usury. 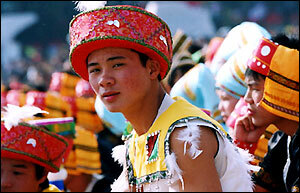 The Mulams used to be animists, and celebrated a festival every month, the most important of which was the Yifan Festival. At this celebration, pigs and sheep were slaughtered, dramas and lion and dragon dances were performed, and the shamans chanted incantations. The lunar New Year's Day was the Mulam's New Year, and the eighth day of the fourth lunar month was "Ox Birthday," when the oxen were given a rest and fed glutinous rice, and wine and meat were offered to the Ox God. On the fifth day of the fifth lunar month the Dragon Boat Festival was celebrated. Unlike the Han and Zhuang Dragon Boat festivals, the Mulams used to carry a paper boat into the fields and a shaman would chant spells to drive away insects and ensure a good harvest. The 15th day of the eighth lunar month was Youth Festival, when young people gathered to sing folk songs and make lovers' trysts.